Adesto Technologies today introduced a new conductive bridging RAM (CBRAM) memory chip for battery-operated or energy-harvesting electronics used in the Internet of Things (IoT) market. Adesto's new CBRAM chip, a form of resistive RAM (ReRAM) non-volatile memory, is able to perform read and write operations with 50 to 100 times lower power than NOR flash. The line of chips, called Moneta, will only store up to 256 kilobits (Kbit) of data each because they're meant for use in sensors or wearables where they only temporarily store the data before transmitting it. The chips will be used in everything from medical devices and industrial machinery to building HVAC systems. 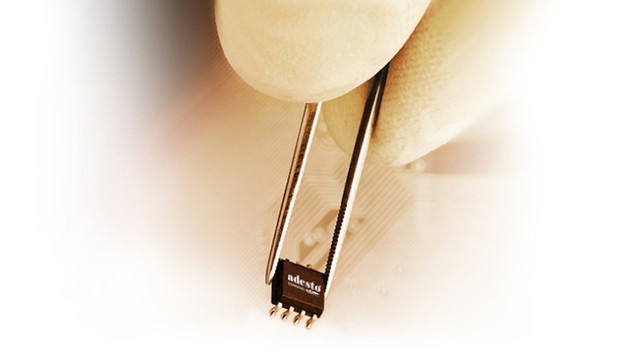 Adesto Technologies' conductive bridging RAM chip. For example, the chips will be used for building environmental sensors and can log data that will help track and regulate temperature and airflow. The CBRAM chips could also be used in health and fitness trackers, such as Fitbits, which monitor the number of steps a wearer takes over a set period of time or measure a person's heart rate and other vital signs. ReRAM uses a passive two-terminal electrode that stores data using ions that change the electrical resistance. Resistive RAM (ReRAM) uses a passive two-terminal electrode that stores data using ions that change the electrical resistance. ReRAM can greatly reduce the energy consumption of modern IT systems while increasing performance, according to researchers from the Jülich Aachen Research Alliance (JARA). ReRAM is based on the "memory resistor" concept, also called memristor. The term memristor was coined by University of California, Berkeley, scientist Leon Chua in the early 1970s. Until memristor, researchers knew of only three basic circuit elements -- the resistor, the capacitor and the inductor. Memristor added a fourth, which consumed far less energy than previous technologies. Adesto already has 500 customers that have integrated its previous NAND flash or CBRAM chips into products, according to CEO Narbeh Derhacobian. Adesto's last CBRAM chip, called Mavriq Serial Memory, used about .25 milliamps (mA or one thousandth of an amp) for reads and 1mA for writes and 1µW (a microwatt or one millionth of a watt) in standby mode. Adesto's new Moneta CBRAM chips use 10µW for reads and 7.5µW for writes and has an "Ultra-Deep-Power-Down" standby mode that uses just 0.05µW. Mavriq was a drop-in replacement for memory in a standard ROM serial socket. Moneta is not designed for a standard socket; it is specifically designed as a companion chip for ultra-low energy IoT systems, such as smart medical devices and ultra low energy or energy harvesting sensors of the future. "Mavriq is still very low-power compared to other chips, but limited by the design of existing sockets," an Adesto spokesman said. "Moneta is a brand new design for memory that really demonstrates the full capability of CBRAM and sets a blueprint for the future. That's why we're saying it's the first ever chip built from the ground up for IoT." While the capacity of the Moneta CBRAM new chips is nominal, they are set apart from any other non-volatile memory product in that they're the only ReRAM chips shipping today for a market that is set to experience enormous growth and change this year. Intel and Micron announced last year that they will begin shipping a resistive RAM product called Optane this year. Optane, which is the brand name for a technology called 3D Xpoint, is 10 times denser than DRAM, and 1,000 times faster and durable than flash storage, according to its makers. A depiction of Intel's and Micron's 3D XPoint (also known as Optane) chip resistive RAM architecture. It removes the need for bit-storing transistors and instead uses a latticework of wires that use electrical resistance to signify a 1 or a 0. "We wrote a report on that in October, and estimate that it could optimistically ship over $2 billion worth of product in 2019, provided absolutely everything goes right. Samsung was recently quoted by BusinessKorea as having their own version of this," said Jim Handy, director of market research firm Objective Analysis. Handy said the ReRAM market is still relatively small, with about $100 million in revenue a year. By comparison, the DRAM and NAND flash markets each represent about a $30 billion a year in sales, he said. Gartner, however, predicts 6.4 billion IoT devices will be in use this year, a 30% increase over last year. By 2020, that number will increase to 20.8 billion. Those IoT devices will need extremely low-power, high-performance non-volatile memory to store data. "IoT and smart nodes are at the heart of the industry that is believed to be the biggest semiconductor volume driver in history," Derhacobian said. The SCM products are expected to be marketed for use in enterprise cloud infrastructures.They are based on HP's memristor technology. "Nearly everyone in the memory arena is developing some sort of ReRAM, but Adesto is relatively alone in shipping it," Handy said. Phase-change memory (PCM), which some companies call ReRAM, is being shipped by Micron today, and STMicroelectronics and Intel and their spinoff Numonyx formerly sold it. Gideon Intrater, chief technology officer for Adesto, said the company's CBRAM chips use about 100 times less power than NOR for data reads and 50 times less for writes. "Our memory helps extend battery life by about 30%," Intrater said. Among other uses, the chips will be distributed in thousands of tiny sensors in a skyscraper where they'd collect data about atmospheric conditions. If a sensor's onboard data storage required a lot of energy, it would also require that the batteries be changed often -- an arduous task with thousands of tiny sensors. "These sensor nodes have very different requirements than your cell phone," Intrater said. "You don't need a processor with gigahertz speeds or high memory capacities. What they do need is intelligent integration and low power consumption." A sensor in a building is in sleep mode 90% of time, but then it wakes up and reads environmental temperature, stores the data locally for a period of time and then goes back to sleep. Every so often, the data is streamed out to a central "smart" HVAC system. "Samsung shipped PCM (or PRAM) in a cell phone a number of years ago," Handy said. ""If you don't call PCM a ReRAM, then Adesto is the only company now selling product."